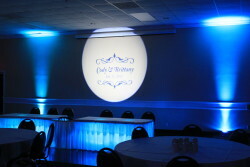 Beautiful Ballroom & Wedding Up Lighting Rentals in St. Louis and Central Illinois. Did you know that we offer Up Lighting services, too? We can create your wedding or event colors with vivid up lights to transform your venue from great to unforgettable! These also compliment our DJ setup very well and give our set a very nice “ambient” glow. Up lighting offers a great opportunity to highlight the architectural elements in a room, create a sense of depth, or add a wash of color that can coordinate with the colors being utilized in your celebration. This style employs one light with a color filter that stays on throughout the duration of your event. They are typically placed at the bottom of a wall shining directly up towards the ceiling. We use top-of-the-line LED up lights which are considered the industry standard. Choose both the Up Lighting package in combination with the LED dance lighting and you are sure to have the night of your dreams! Just wait until you hear all of the “ooohhs and ahhhs” from all your guests! Up lighting is the one of the best, easiest, and most affordable ways to bring more decor for your wedding. Your DJ can up light your whole wedding in any color! We offer up lighting services for far less than you might think so call us now! 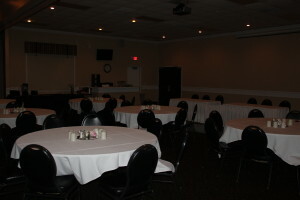 The front of the reception hall including the head table with track lights only. 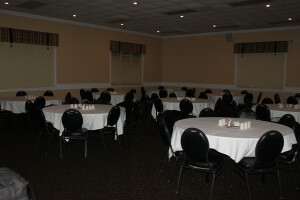 The back of the reception hall including all of the guest tables and track lighting only. The front of the reception hall with light blue up lighting, up lighting under the head table, and a custom monogram with the name of the bride & groom and the date of their wedding. 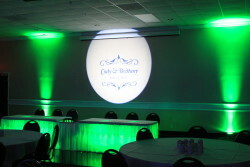 The front of the reception hall with green up lighting, up lighting under the head table, and a custom monogram with the name of the bride & groom and the date of their wedding. The back of the reception hall including all of the guest tables and navy blue up lighting. The back of the reception hall including all of the guest tables and green up lighting. The back of the reception hall including all of the guest tables and red up lighting. The back of the reception hall including all of the guest tables and purple up lighting. With your walls awash in color, you’ll want to consider having a monogram of your wedding or event projected on one of your ballroom walls. We’ll work with you to design the monogram that reflects your theme and style. Monograms, also called gobos, can have your names, initials, date, image, etc; we can provide you with several design options! We’ll design whatever you have in mind and even provide you with a “proof” before we finalize your monogram! 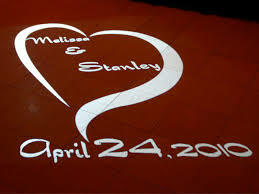 Typically, the custom gobo/monogram emits a white/yellowish light; however, color gobos are available as well. We also can light up your table linens from underneath, creating a spectacular dining experience for your guests. Under-table lighting may include head table, cake table, gift table, guests tables, and any other you specify. You can choose any color or blend of colors to match or complement your wall and ceiling colors. It can also be used effectively in a stand-alone fashion. Under-table lighting creates a dramatic “WOW” effect for weddings, quinceañeras, bar/bat mitzvahs and formal banquets, balls and galas. We offer a wireless LED pin spot lighting service that will greatly enhance your centerpiece decorations and wedding cake, casting them aglow in a warm-white, magical light in a darkened room. LED Pin spots will give your beautiful wedding cake and flowers the attention they deserve, adding great aesthetic value to them. 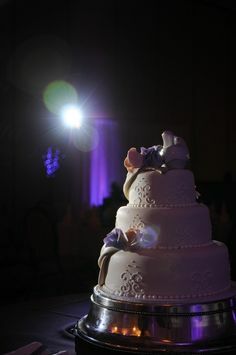 We use a high-contrast optical system that illuminates your cake and flowers within a super-narrow 3-degree beam, rendering a dramatic effect with no glare. Our spotlights are small and wireless so we can install them safely in almost any banquet room or event center.